Thrillers are so popular now that it seems we get a new one every week. I've already reviewed Now You See Me and Trance, both movies from this year which are vaguely entertaining in an I Have No Idea What's Actually Going On kind of way. The problem with these is that quite often they're not given enough detail, or their plots are too focused on the big twist, so that the excitement of the first time completely disappears on subsequent screenings. These are the movies that will get audiences into the theater but disappear after their home video release, satisfying big production companies but ultimately fading into history. 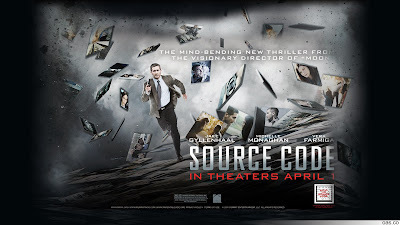 So I think it's safe to say that my expectations were pretty low for Source Code, a two-year-old sci-fi thriller that flew completely under my radar until recently. While there's one giant flaw in the film which will keep it in relative obscurity, I was pleasantly surprised with everything else. 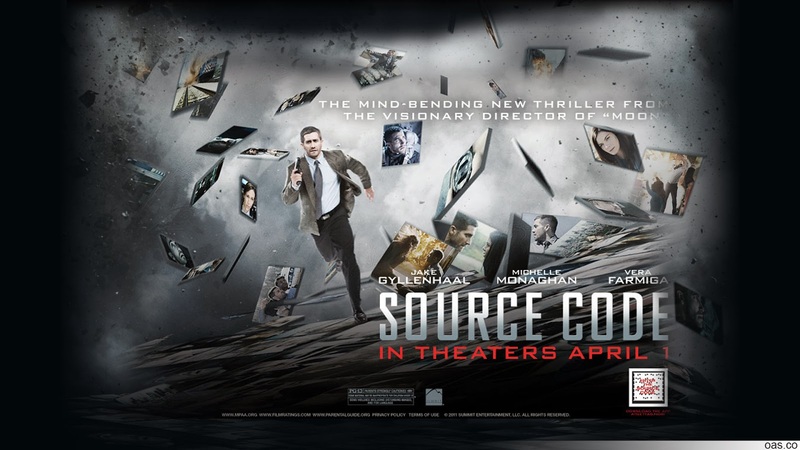 If you're the kind of person who's bothered by inaccurate technical jargon or poorly explained plot mechanics then you may want to turn back now, because the Source Code project which gives this film its title has nothing to do with source code and doesn't really make a whole lot of sense to boot. The idea is that when somebody dies, they retain the last eight minutes of their memory for a short period of time, and the Source Code allows a user to enter into a virtual reality version of those eight minutes until the person deteriorates from mostly dead to all dead. The police use this to find a man who bombed a train by entering the residual memory of one of the victims, and honestly if you can accept that sort of sci-fi nonsense you should probably just go watch this movie as soon as possible because it's (almost) only uphill from there. So Jake Gyllenhaal is the one chosen for the program because he's drift compatible or something equally silly and unexplained, and he enters the Source Code from this remote, isolated pod thing. As strange as it may seem, this pod is actually one of the coolest parts of the movie. 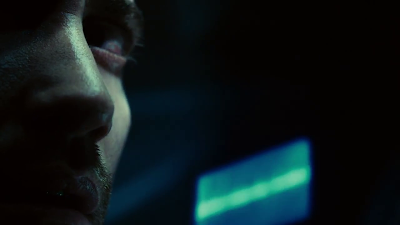 It's shot from incredibly restrictive angles with very dim lighting so that you can't really see anything beyond Gyllenhaal's face, and this claustrophobia adds an ominous and mysterious quality to his job from the very beginning where lesser movies would use unnecessarily confusing dialogue or scenes that won't make sense until the denouement. As Gyllenhaal builds his proficiency with the system, the camera progressively pulls back more and more to show the strange place in which he's contained, until the big reveal at the end which in a strange turn of fate I really don't want to ruin. This movie also runs into a similar issue that Groundhog Day dealt with previously: showing the exact same things happen multiple times so that you get a sense of the repetition without getting bored. Groundhog Day had Bill Murray's hilarious sense of comedy, and Source Code has the fantastic artistic direction and cinematography from its incredible crew. Duncan Jones, the man who brought us Moon two years before this, is sitting in the director's chair, and on top of this he's working with Don Burgess—the cinematographer behind great movies like Forrest Gump and Contact—and Paul Hirsch—the man who edited classics like the first two Star Wars films as well as modern films like Mission Impossible: Ghost Protocol. Gyllenhaal's performance is also incredibly dynamic, especially considering he's reacting to science fiction mumbo-jumbo that, all things told, doesn't really make much sense. Unlike most movies in this Thriller-of-the-Week club, Source Code actually has some thematic density to it. 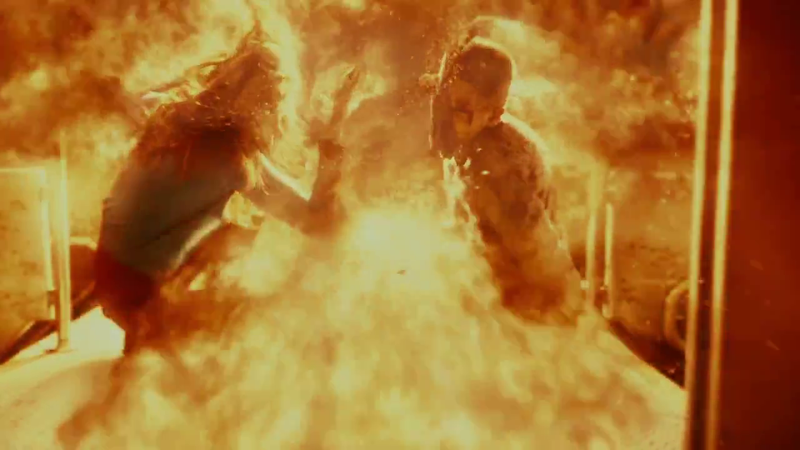 The central question of the film (repeated twice by Gyllenhaal) is, "What would you do if you knew you only had a minute left to live?" This naturally arises with the structure of the plot (Gyllenhaal's virtual reality projection can live for only 8 minutes), but the movie doesn't just leave it at that and walk away hoping for the best. Source Code contemplates the value of love in both the romantic and familial sense while also staging ethical dilemmas contrasting the desires of the individual with the needs of the many. None of these are easy topics, and the film treats them with respect and shows how Gyllenhaal's character struggles to deal with them and mature as a human being. But at the end, after there's this amazing, heartfelt moment reconciling Gyllenhaal's achievements in life with the inevitability of his death, the movie throws a curve ball with less than five minutes left left of the clock. This curve ball brings with it a happy ending to a movie which would have been rather bittersweet otherwise, but it also takes all this surprisingly rich thematic development it's achieved over the past hour and a half and throws it in the trash can. To be completely honest, I kind of enjoyed watching it happen, but once the credits began to roll I could feel the disappointment wash in like a tidal wave. I distinctly remember a point in the film where I realized that if they wanted to end on a happy note they'd only have two options, both of which would be pretty terrible decisions. Then the movie takes a decidedly heart-wrenching turn, and against my better judgment I decided to hope for an authentic and sincere ending from this surprisingly good movie. Just when I begin to see light at the end of the tunnel, the movie throws in not one but both of the rule-breaking, tension-defying endings and tops it all off with some mushy rubbish about fate. Now don't get me wrong, this train wreck of an ending might cause me to turn Source Code off prematurely, but it doesn't change the fact that it was definitely one of the best thrillers I've seen recently. If I remember correctly, there's some sort of romance where the main character tries to jumpstart some sort of recall in his love interest each time he wakes up. Maybe I'm thinking of the wrong movie. I do think it's a good movie, though only slightly satisfying for me. I didn't find it repetitive, but it definitely needed a few extra ideas. The '8-minutes memory' is something specific I like about sci-fi because it's not really explained, but who cares? It serves the plot well. With this movie, I agree it's probably not going to live long in anyone's memory. I could see myself watching it again, though. I don't remember anything like that, although the romance is a little weird in the movie because he's this other person in the woman's eyes. I don't know, I thought the movie would have been better without it, or at least without the cheesy ending. I also enjoy sci-fi silliness regardless of whether it makes sense, I just know there are people out there that would be bothered by it. I would also watch this movie again, although it's not going to be on the top of my list any time soon I don't think. Way too many movies out there I haven't seen.